1. Local Produce. 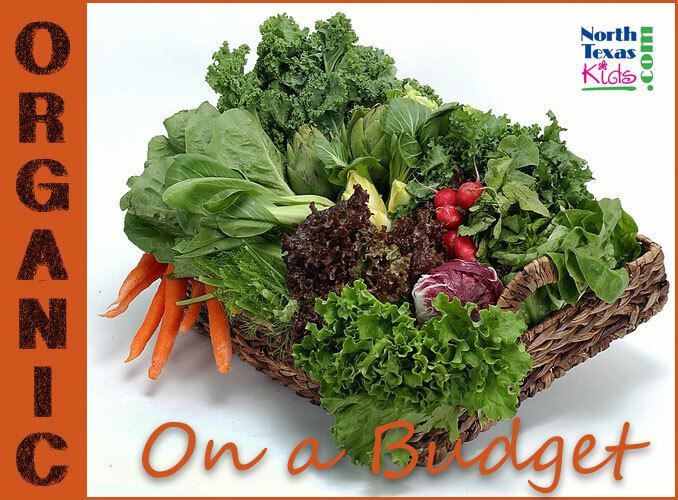 Hit the farmer’s market to help out some local farmers while you save money on organic items. Here’s a list of local farmer’s markets in DFW. You can also try Local Harvest to search for farms, farmer’s markets, CSA (community supported agriculture) and more. 2. Grow your own organic garden. Sounds hard, doesn’t it? But trust me, if I can do it with my two non-green thumbs, so can you. My husband is usually the gardener in our family but one summer he was traveling and the responsibility fell on me! I found out how easy it is to pull weeds and water tomatoes, carrots and green beans. I finally realized we never bought any weed-killer or pesticides, which meant we basically have an organic garden. Even if you live in an apartment you can grow herbs in a pot, have a patio garden or even consider renting space out from a local gardener. Renting space is still cheaper than buying organic fruits and veggies from the leading natural foods market. Check out the Dallas Area Community Gardening Program to browse garden space for rent by city. 3. Coupons and sales, baby! Watch, wait then POUNCE on those items your family loves when they go on sale or when you have a sweet coupon. Head to My Organic Coupons. You’ll find a list of companies you can write to, and ask for coupons for their specific products. Combine coupons with sales for some extreme couponing and you’ll be dancing in the aisles! 4. Seasonal Items. Why pay $5/carton for organic strawberries when they can get as low as $1.50/carton in the good old summertime? It’s easy to find out which fruits and vegetables are in season Field to Plate’s site. 5. Stock Up. When you find a good deal, stock up! It’s easy to freeze certain items while you make jellies, jams, etc. with the rest. Can your own spaghetti sauce, carrots, beets, green beans and more from what you grow yourself (sometimes you have way more than you can eat coming in all at once), get a good deal on at the farmer’s market or find on sale at the natural foods market. Canning is easier than it sounds, and you can find a used pressure cooker or borrow one for a weekend. Simply Canning has a wonderful site with many great resources, then hit YouTube for how-to videos. 6. Buy in bulk. Because you’re not paying for packaging and name brands, some organic basics like cereal, grains and beans are much cheaper when dispensed from a bulk container. 7. Skip the “junk.” Organic graham crackers and fruit snacks cost a fortune. Why not try some carrots and hummus or make your own yummy granola bars to save a bunch of green? 8. Bake Your Own. We all need a good carb fix now and then. Rather than pay crazy baked-good prices, find a used bread machine for a steal and make your own. It’s so easy these days to get the dough ready, pop it in the machine and just wait while your house fills up with the intoxicating aroma of baking bread. AllRecipes.com has tons of wonderful bread machine recipes that will impress your friends and family. Likewise, bake your own organic treats (think muffins and granola bars) using organic flour, cocoa, oatmeal, etc. that you find for cheap using my tips above! Kerrie McLoughlin writes about all the fun challenges of parenting 5 little ones, including feeding them!, at TheKerrieShow.com. I also like to shop for deals on Amazon. They have a large variety of organic and natural items in bulk. We choose primarily organic foods – always the dirty dozen, but are more flexible in terms of other items. I don’t have a deep freezer, but do buy up as much organic meat as I can when it goes on sale. I monitor the sale cycle for my “local” Whole Foods (it’s 1+ hour away), and stock up when I can. Thanks for the great tips! We have been transitioning to a more organic diet and our grocery spending had gone up a lot also. I’ve had a garden for five years. The kids started helping last year and this year will be even better (they’ll be three). I have a black thumb and still manage to provide for my family, the neighbors and our local food bank. Thanks for the comments! Such great tips from a great community of moms!